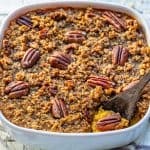 Healthy and easy butternut squash casserole topped with a delicious pecan crust. Place the squash in a roasting tin, cut-sides up. Drizzle with olive oil and turn it cut side down into the roasting tin. Roast for 45-50 minutes, or until fork tender. Once roasted, allow it to cool, then scoop all the flesh out into a bowl. Add in eggs, butter, coconut sugar, vanilla, salt, nutmeg, and cinnamon. Whisk with a hand mixer until well combined and fluffy. Spray a 9x13 baking dish with cooking spray and add in the butternut squash mixture, layering it evenly with a spatula. In a mixing bowl add all topping ingredients, except pecans. Toss with a fork until moist crumbs form, then stir in the pecans. Layer the topping evenly over the butternut squash mixture, then bake for about 45 minutes, or until golden brown and set in the center. Enjoy it warm or cold!